Samsung may not be the first on the market with a 4K mobile display (that honor goes to the Sony Xperia Z5 Premium), but it looks like the Korean phone maker is readying its own 4K screen in an upcoming phone. Samsung showed off its new display at the Display Week conference in San Francisco this week, as spotted by UploadVR. The display measures 5.5 inches and boasts a resolution of 2160 x 3840, which is an insane 806 pixels per inch. 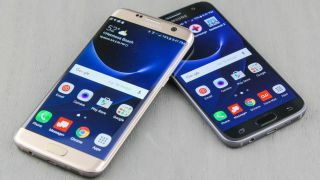 Samsung's current Galaxy S7 and Galaxy S7 Edge flagship phones boast quad HD resolutions (1440 x 2560), but an upcoming Samsung device may get the 4K treatment, like the next Galaxy Note. While most phone users won't notice the difference between quad HD resolution and 4K when poking around the web, it starts making sense when you take the Samsung Gear VR into account. Samsung's mobile VR headset is powered by its phones, so having a 4K display will help make VR content look more realistic. Currently, there's a slight "screen door" effect when using the Gear VR, as you can see the individual pixels of the display. That's because VR requires the display to be divided into two, one for each eye. If Samsung put a 4K display into a forthcoming phone, it'd better be packing some serious power. Having a 4K display sounds great, but it will have to ensure its phones are fast enough, and have big enough batteries to compensate for the increased screen resolution.